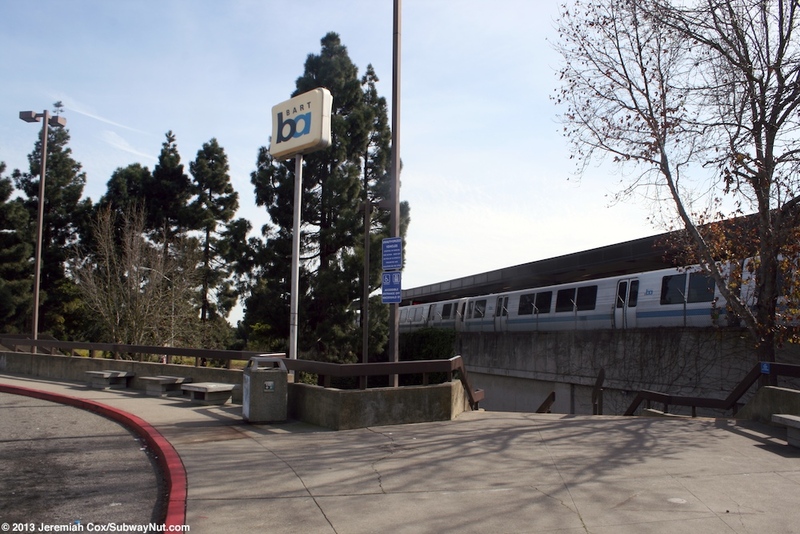 Richmond is the northern terminus of BART line and opened on January 29, 1973 on its own ROW parallel to the Southern Pacific Railroad tracks used by Amtrak (then just the Coast Starlight and San Francisco Zephyr). 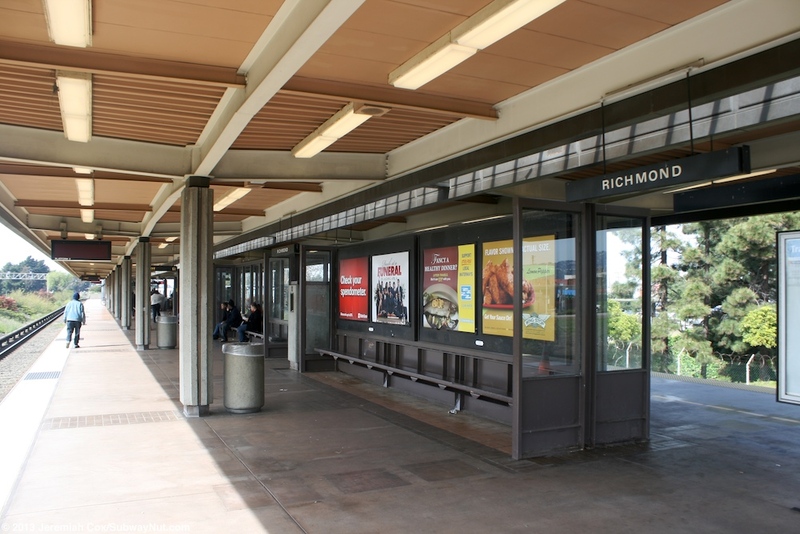 In 1978 Amtrak opened its Richmond Station specifically designed to connect to BART. 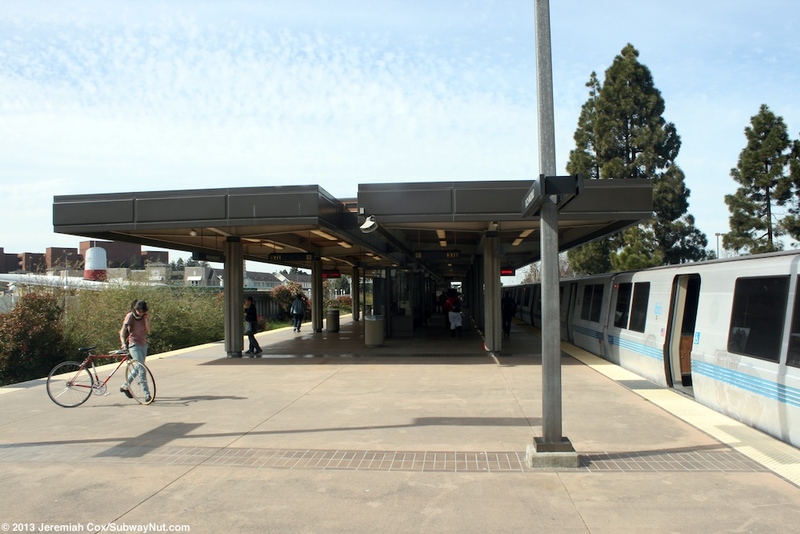 The station is currently undergoing up-development with the Richmond Transit Village. 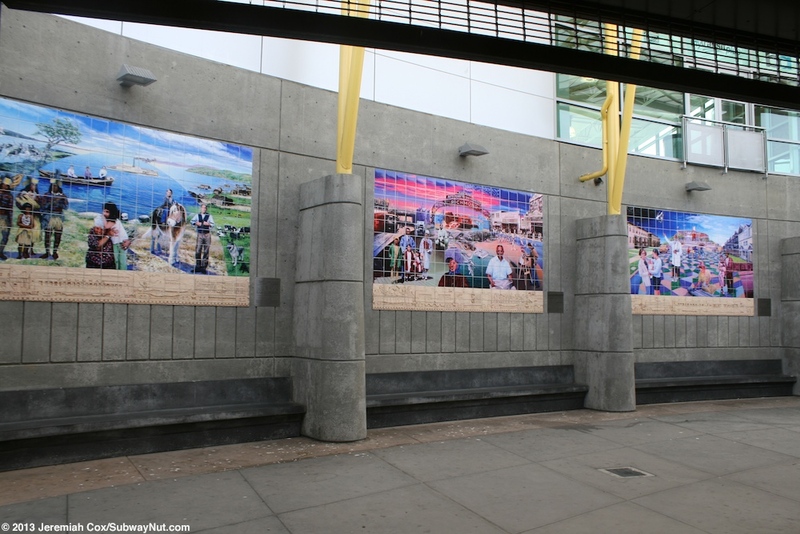 Phase I of the village opened on the west side of the station on October 18, 2007 with a new transit oriented development including residential and commercial homes. 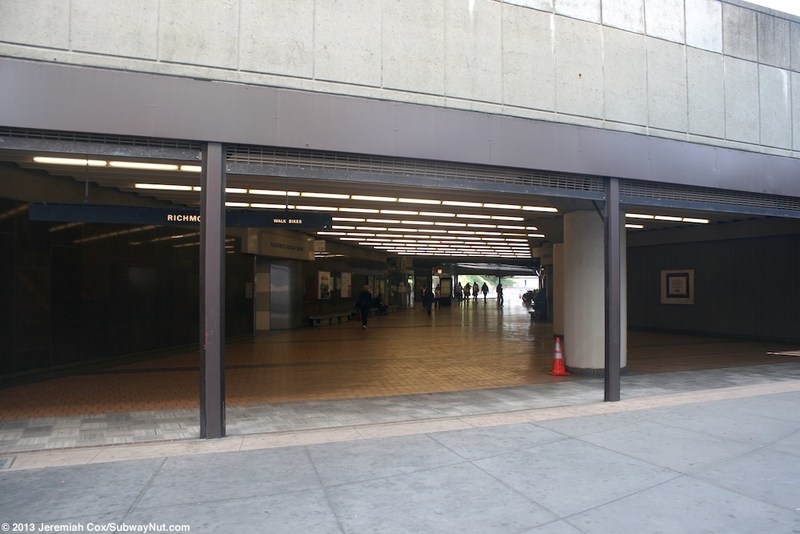 This included the new entrance and transit store at the west plaza of the station. 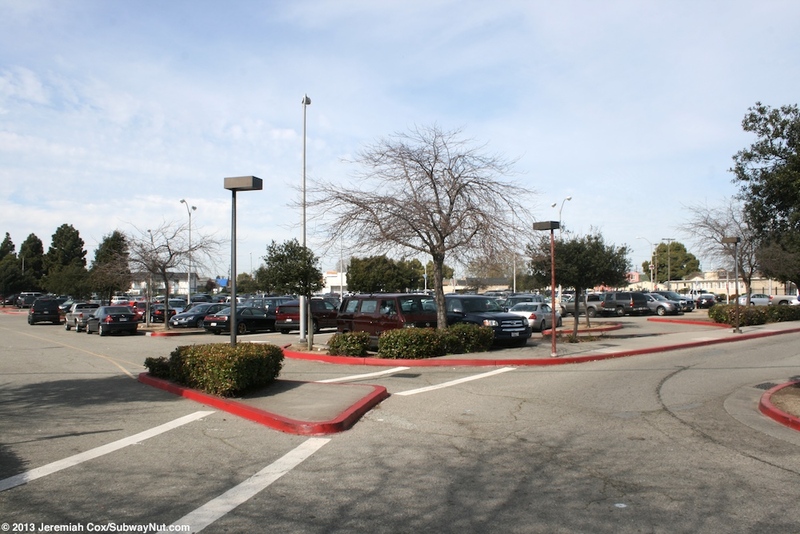 On May 30, 2013 a new six-story 769 space parking garage opened (with retail in the bottom) replacing the original surface spaces along the east entrance to the station that will become buildings in Phase II of the transit village project. When this parking garage open the station began charging a $1 until then parking at the surface lots was free. This entrance is still open to pedestrians that have to pass fences closing off the original parking lots. 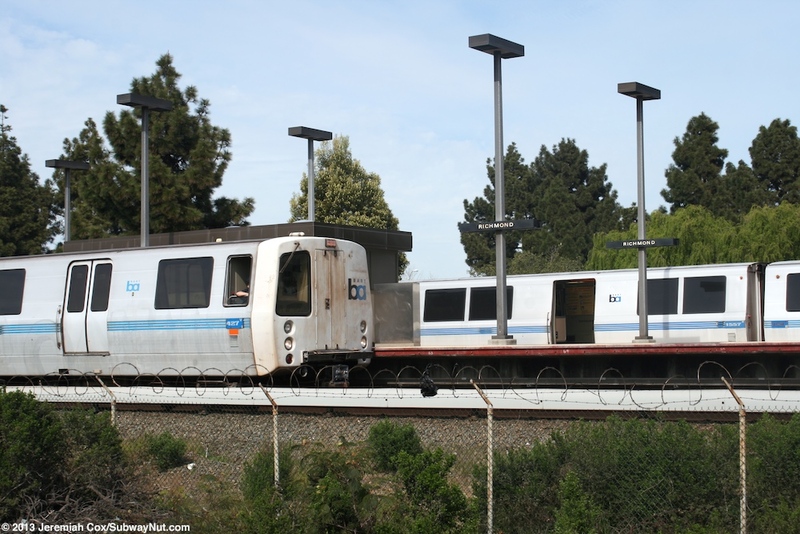 BART trains have a single island platform and although the station is a terminus, the tracks continue north to the Richmond Yard beyond the station. 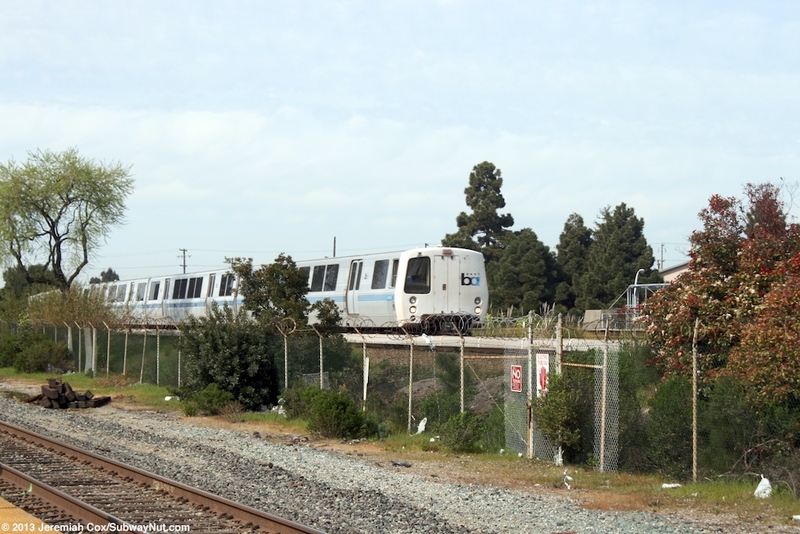 Trains use cross-over switches before and within the train yard to preform their relay moves. 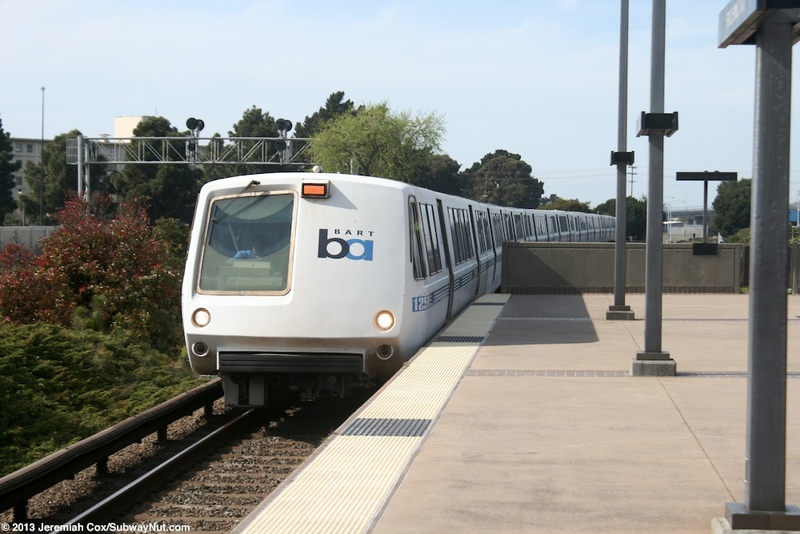 This means all trains arriving in Richmond go out of service. 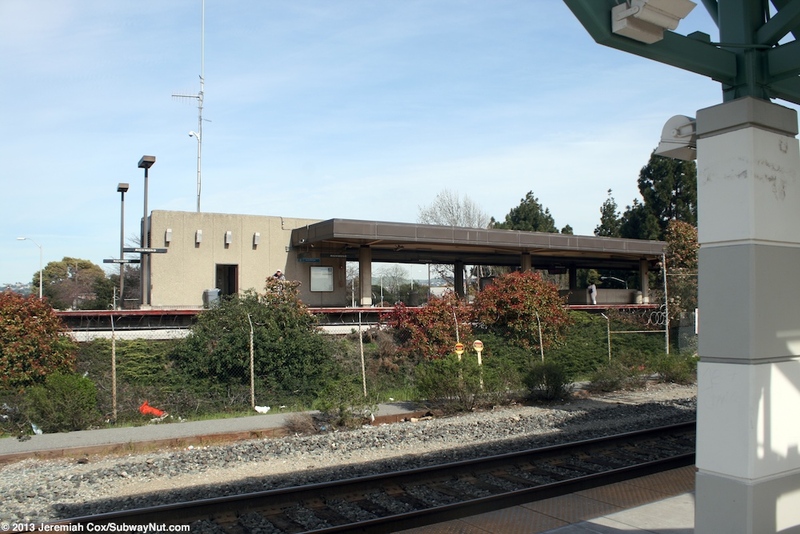 This island platform hasn't been touched by the transit center redevelopment and has a flat-roofed canopy covering about half its length. 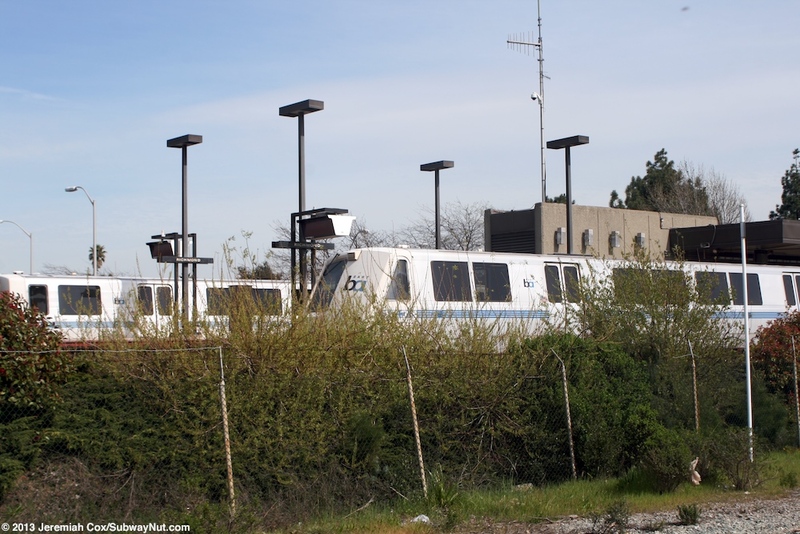 There are also a few small buildings on the platform for employees since Richmond is a terminus. 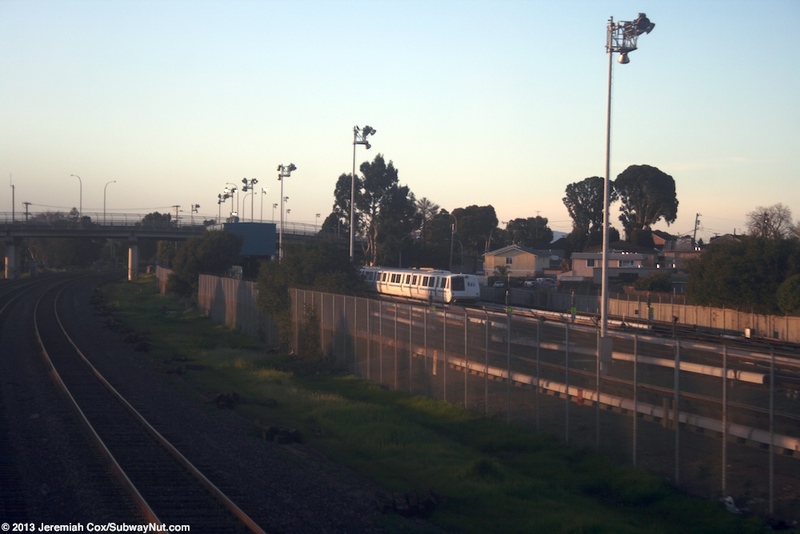 The Amtrak Richmond Station is parallel to the BART Station, just west of it with grass, trees and a chain-linked fence separating the two systems that are both at similar levels basically at a grade on slight embankments. 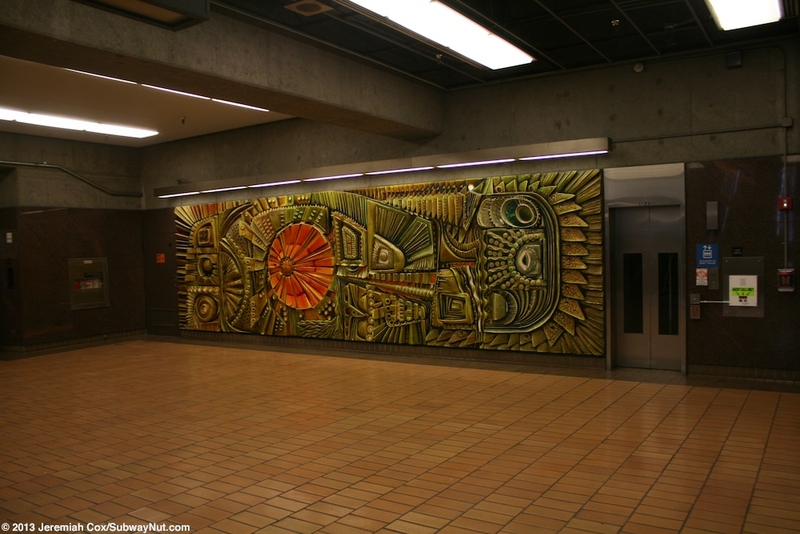 To leave the platform there are two escalators with a narrow staircase in between them and an elevator. 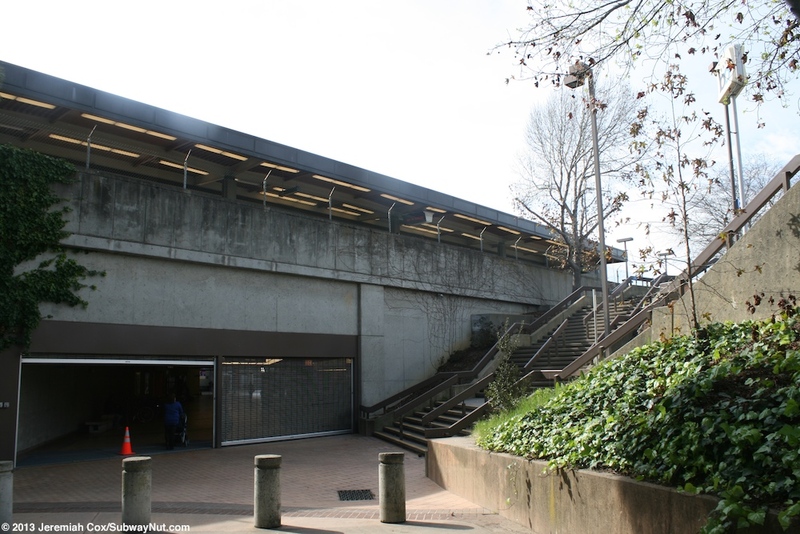 These lead down to a central tunnel that also provides the only access to the Amtrak Platform. 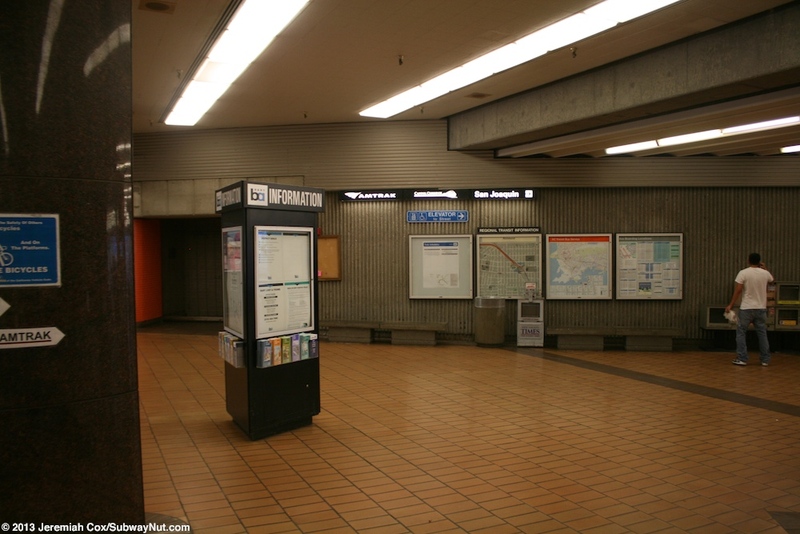 BART has the normal 1970s mezzanine with concrete walls and a brown floor that extends to the rest of the tunnel. Along one wall of the mezzanine is an unusual sculpture with a marine theme by artist William Mitchell. 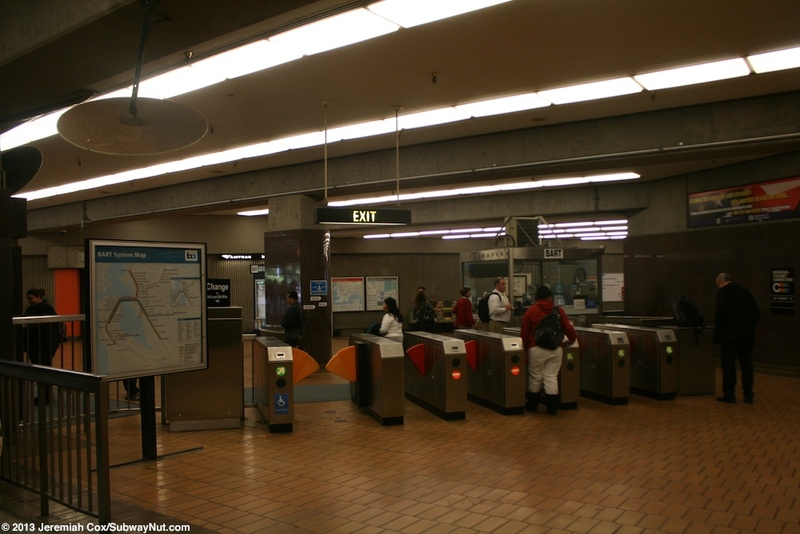 To leave the station there are exits at either end of the tunnel that also connects BART and Amtrak. The east exit leads to the station's just closed, original parking lot. 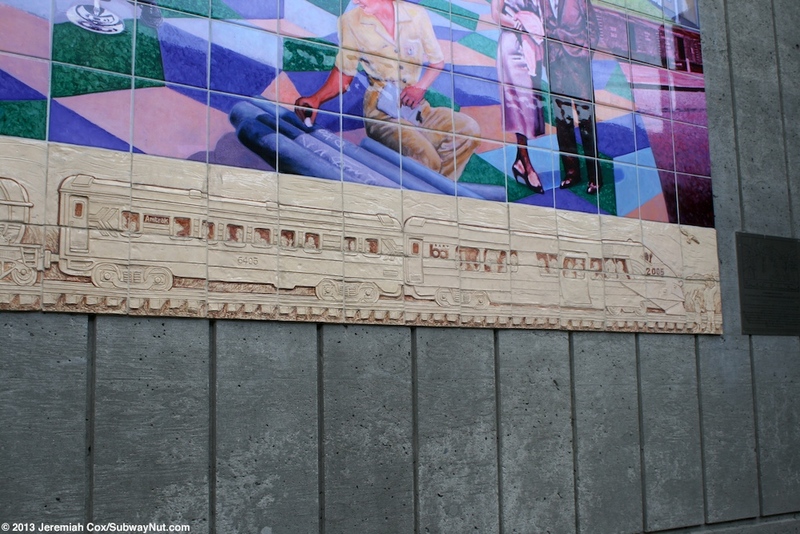 A central sidewalk gradually leads uphill from the tunnel to 19th Street, across from the end of Nevin Avenue. Now fenced off staircases lead up to the now closed and fenced off original parking lot. All of the recent construction has been at the west entrance. 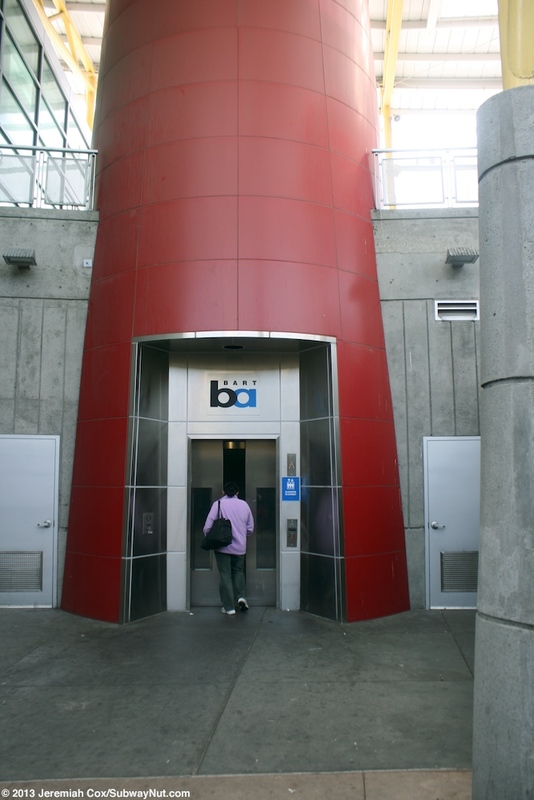 There is now a wide staircase and modern elevator shaft in a red tubular-looking structure. 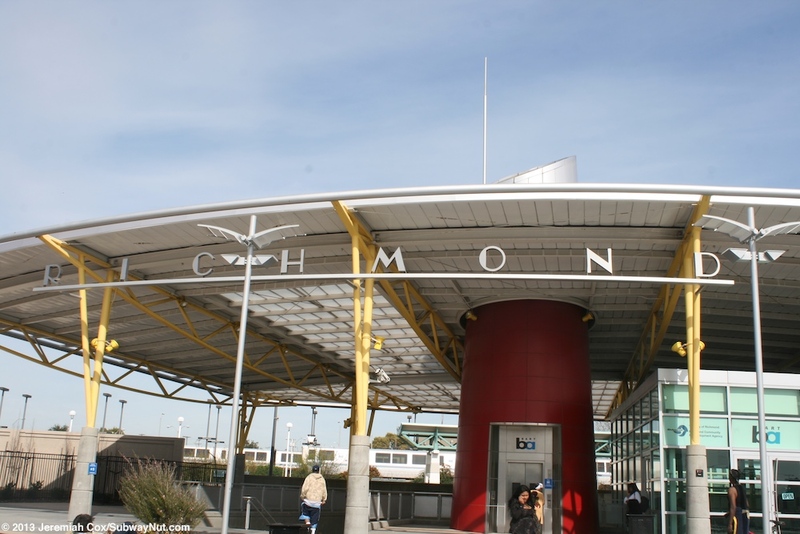 These have an extremely oversized canopy that also covers a small building that is a customer service office for the Richmond Transit Center. Turning north or keeping streight leads into the Transit Village. 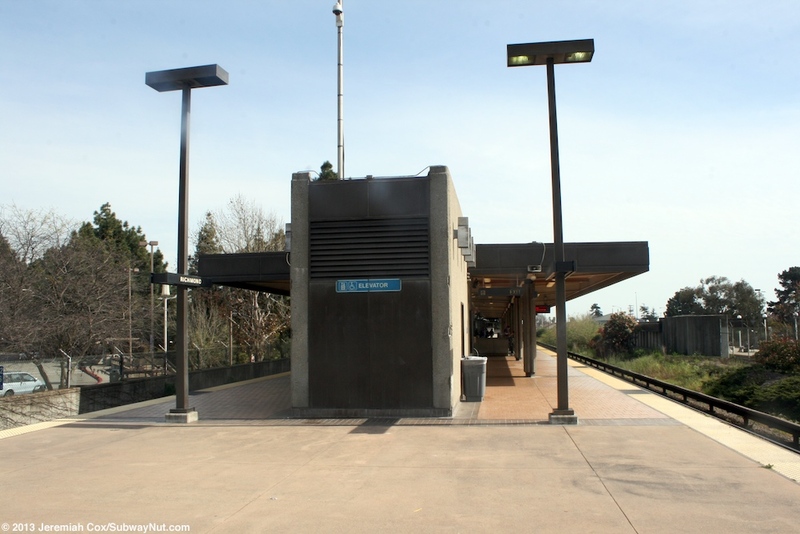 Going south leads to the station's new bus loop. This loop consists of three islands and approximately 9 shelters. Each shelter is an identical modern design with cream supports holding up a flat roof. It covers a concrete bench with a small windscreen around it. The stations new parking garage is just beyond the bus loop.